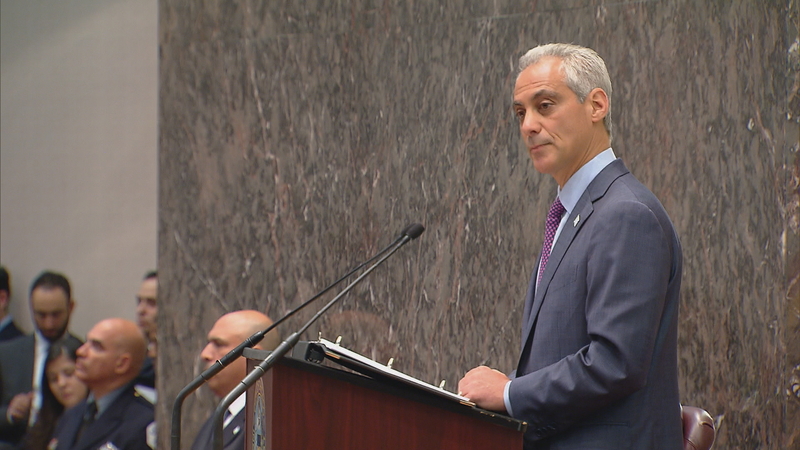 Mayor Emanuel on Tuesday called his proposal to raise city property taxes a "last resort" plan. At his budget address he said the city can no longer delay tough decision making as city finances continue to worsen. The choices he unveiled to meet pension obligations and a budget shortfall are among the harshest the City Council has ever had to deal with. The proposal includes a $543 million property tax hike to be phased in over four years; an additional $43 million for school infrastructure improvements; a first-ever garbage pick-up fee of $9.50 per month; and increased taxi and ride-share fares and fees. Here to share their reactions to the mayor's dire fiscal plan are Ald. Jason Ervin (28th Ward), Ald. Ricardo Muñoz (22nd Ward), Ald. Patrick J. O'Connor (40th Ward) and Ald. Carlos Ramirez-Rosa (35th Ward). On Thursday, Mayor Emanuel joins "Chicago Tonight" to discuss his proposed budget. What do you want to ask the mayor? Share your questions in the comments section or join the conversation on Facebook. You can even post a video of your question to our Facebook page for possible use on air! First, as massive as they are, these tax hikes are not nearly enough to cover the full amount of Chicago’s debts. Without real pension and spending reforms, still more property-tax hikes will be needed. And second, the tax hikes will only serve to shrink Chicago’s tax base, as more residents may flee what was recently named the seventh-most expensive city in the world. More taxes will only accelerate the out-migration of residents that has been going on for decades and has been a boon for Chicago’s collar counties and Lake County, Indiana. Governor Rauner is overstepping his authority and creating obstacles to the democratic process by threatening to veto the Mayor’s request for a change in the property tax exemption. Instead of supporting property tax relief for Chicago homeowners, the Governor is interfering in the City’s operations by insisting that Mayor Emanuel follow his lead by engaging in union busting as a quid pro quo for the Governor’s signature. Innovation Illinois urges Governor Rauner to withdraw his veto threat and allow passage of any reasonable changes in Illinois law that Mayor Emanuel and the City Council consider necessary to putting the City’s finances back on track. The nearly $600 million property tax increase will have a disproportionate impact on low-income homeowners and seniors. That is why we support the administrations’ efforts to expand the Homestead Exemption in Springfield. But with no end in sight to the gridlock in Springfield, passage of the expanded exemption is not assured. That is why we are offering a meaningful rebate program for working families who own their homes. Our ordinance will be introduced at Thursday’s City Council meeting. The caucus also took issue with the administration's failure to include an alternative minimum property tax on the central business district; the possible outsourcing of 311 jobs; and the opening of airports and McCormick place to ride-sharing services such as Uber and Lyft.